the discharge of a secondary oocyte from the graafian follicle; in an adult woman this normally occurs at intervals of about 28 days and alternates between the two ovaries. As a rule, only one secondary oocyte is produced, but occasionally ovulation produces two or more; if more than one subsequently become fertilized, the result may be multiple births, such as twins or triplets. adj., adj ov´ulatory. Ovulation takes place approximately at the midpoint of the menstrual cycle, 14 days after the onset of menstruation. During the preceding weeks, a graafian follicle (cell cluster in the ovary containing the oocyte) grows from the size of a pinhead to that of a pea. At the moment of ovulation, the follicle bursts open and the ovum is discharged. The discharged ovum enters the fallopian tube adjoining the ovary and moves toward the uterus; if it encounters a spermatozoon while it is still alive (about 48 hours), the two merge and fertilization takes place, usually in the fallopian tube. The fertilized ovum then makes its way to the uterus, where it becomes embedded in the prepared wall as the first stage of growth of the fetus (see illustration, and see also reproduction). If fertilization does not take place the ovum loses its vitality and the blood and tissue lining the uterus are shed in the menstrual flow. ovulation method cervical mucus method; see discussion under contraception. 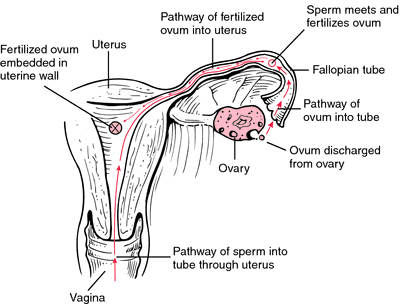 Release of an ovum from the ovarian follicle. expulsion of an ovum from the ovary on spontaneous rupture of a mature follicle as a result of cyclic ovarian and pituitary endocrine function. It usually occurs on or about the eleventh to the fourteenth day before the next menstrual period and may cause brief, sharp lower abdominal pain on the side of the ovulating ovary. See also oogenesis. ovulate [ov′yə′lāt] , v.
Release of an oocyte from the ovarian follicle. The release of an OVUM from a mature Graafian follicle in the OVARY. Ovulation occurs about half way between the beginning of consecutive menstrual periods, usually about 14 days before the expected date of onset of the next period. the bursting of the OVARIAN FOLLICLE (See also GRAAFIAN FOLLICLE on the surface of the ovary with the release of an egg which then normally passes into the OVIDUCT. The phase of the female monthly cycle when a developed egg is released from the ovary into the fallopian tube for possible fertilization. the discharge of the ovum from the graafian follicle. The discharged ovum enters the uterine tube adjoining the ovary and moves toward the uterus; if it encounters a spermatozoon while it is still alive (about 48 hours), the two merge. Fertilization usually takes place in the uterine tube. The fertilized ovum then makes its way to the uterus, where it becomes embedded in the prepared wall as the first stage of growth of the embryo. See also estrus, estrous cycle. simultaneous ovulation in both ovaries. the ripe follicle does not rupture and discharge its ovum. site of rupture of mature follicles. standard procedure in species other than cats. strands of fibrin, proliferating capillaries and leukocytes on the peritoneal serosa close to ovulation sites especially in mares and cows.